Over the past few years, Conrad Shawcross has become a master at blending his extraordinary sculptures into London’s urban and suburban fabric. The Dappled Light of the Sun graced the Royal Academy’s courtyard during the 2015 Summer Exhibition and Frieze Sculpture Park at Regent’s Park later that year, while Three Perpetual Chords (2015) and Paradigm (2016) are permanently sited in Dulwich Park and King’s Cross. Recalling some of his earlier latticed work and towering mathematical structures, his latest project, in the Greenwich Peninsula, is his most ambitious in scale and scope to date. Shawcross is no stranger to Greenwich (in 2005, he displayed Continuum in the Queen’s House, as part of the National Maritime Museum’s ‘New Visions’ programme), and his new piece is joining a sculpture trail of sorts, dotted with works by Antony Gormley, Richard Wilson and others. Shawcross, however, is quick to say that The Optic Cloak is not a sculpture but an architectural intervention, subservient to a utilitarian function. It was commissioned for a low-carbon power station that will provide energy to 15,000 homes in one of Europe’s largest urban regeneration projects. The initial brief was to cover the chimneys of the Energy Centre, but rather than conceal the flues, Shawcross wanted to celebrate them, and played with the paradox of making them more visible rather than invisible. The cloak doesn’t just adorn the structure, it is an integral part of it; it defines it. For Shawcross, the environmental concerns were an essential element of the project, in line with the nature of the power station itself. Rather than merely cladding the flues in a decorative mantle, Shawcross and his team worked directly with the existing structural designs, to create a lighter, more energy efficient structure than originally intended. Subtracting rather than adding material, they saved tonnes of aluminium from the plant’s initial design, to create a facetted metallic fin rather than a bulky, boxy slab. The moral imperative extended to Shawcross’s belief in public work having an impact on daily life. 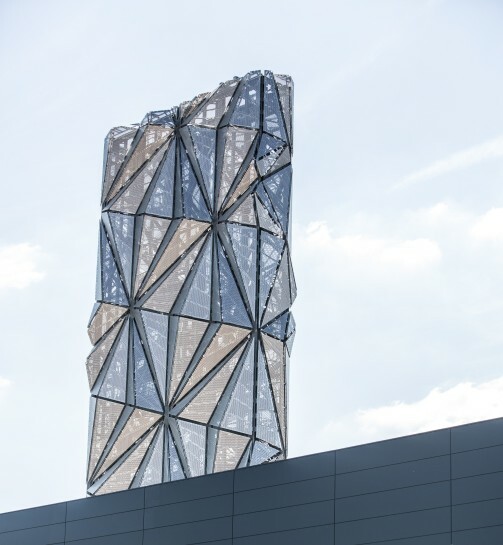 The Optic Cloak is intended not only to enliven the commute of motorists as they approach or leave the nearby Blackwall Tunnel, but to become a treasured landmark for the Peninsula’s residents.